When the couple, both 26, met with a mortgage specialist in December 2013, they found out Biethan would need to improve his score in order for them to get pre-approved for a mortgage. In fact, neither of them knew their credit scores before meeting with the banker, but they were ready to buy their first home after living in Seattle for about six years. "We found out, OK your credit score really affects your interest rate," Kapelke says. Biethan worked to improve his score over the past year, and the two revisited homeownership in the fall. They closed on a townhouse in West Seattle last month. With rents rising into unaffordable territory, housing inventory up and mortgage rates hovering below 4%, 2015 may prove to be the year of homeownership for millions of Millennials. Real estate website Zillow predicts Millennials will overcome Gen X as the largest group of home buyers this year — more than half of 18- to 34-year-olds said they plan to buy a house in the next one to five years, according to a survey by Zillow last summer. But after putting away enough savings, the biggest hurdle for Millennial buyers may be the learning curve that comes with understanding the process, as well as a host of new financial terms, trade-offs and commitments to consider. It's a stressful process, especially when you've never done it before, recent first-time Millennial buyers say. Kenny Coleman, 25, bought his first place — a loft-style apartment in Cincinnati — in December. He says the first bank he went to for a mortgage wasn't good at explaining the financing process to a first-timer. "They used all this jargon," he says. "And they're talking about all these different insurances." Coleman, who says the process took him from "complete idiot to pretty well versed" in a matter of weeks, ultimately went to a different bank that was willing to give him a fixed-rate mortgage instead of an adjustable-rate mortgage. Heading into the popular spring selling season, some real estate companies say they're already seeing interest spike from new buyers. Listings for townhouses and starter homes have seen more traffic in the past month on john greene Realtor's website, says Scott Parker, vice president and sales manager. "There are Millennials on the sidelines that when we provide the right supply on the market are going to be very curious and interested in buying," he says. • First, as Kapelke attests, find out what your credit score is. It's the main factor determining what rates you'll get on a mortgage or whether lenders will work with you in the first place. • Kapelke and Coleman both say they realized it was the right time to buy when they knew they'd be living in their respective cities for the foreseeable future. "Personally, are you going to be living in that area for at least the next five to seven years?" Kapelke says. "You kind of need to be settled, otherwise you're just going to lose money when you're selling (your house)." • You don't have to have the traditional 20% down payment to become a homeowner, says Tim Savoy, a real estate agent with Coldwell Banker in Washington, D.C. He says many of his clients aren't aware of programs, like a local one called DC Open Doors, that will cover much, and sometimes all, of a down payment. And Svenja Gudell, senior director of economic research at Zillow, says more lenders now are willing to work with clients on a conventional loan if you have 10% down or even as low as 5%. FHA (Federal Housing Administration) loans allow you to pay as little as 3.5% down, but are often more expensive than conventional loans backed by Fannie Mae and Freddie Mac, Gudell says. • Fannie Mae and Freddie Mac announced in December that they would back mortgages with down payments as low as 3%. But Gudell says not many lenders will work with buyers putting that little down. Plus, be aware of how much more it will cost you when you have a lower down payment. Anything less than 20% will require that you also pay a monthly mortgage insurance. FHA loans will lock you into private mortgage insurance for the duration of the loan. But if you take out a conventional loan with less than 20% down, you can stop paying mortgage insurance once you have 20% equity in your house, Gudell says. FHA loans also often have higher interest rates and require an up-front mortgage insurance payment in addition to the monthly payment. • Don't become fixated on the listing price of a home, says Parker, calling it one of the biggest pitfalls first-time buyers fall into. Buying a house means you're not only responsible for a monthly mortgage payment but other expenses, such as homeowners insurance and property taxes. Fees associated with closing a sale — such as the origination fee, appraisal fee and courier fee — can also equal another 2%-5% of your loan, Gudell says. If you're in the market to buy a house (or about to begin), you're likely to be engaging in a crash course in home styles. 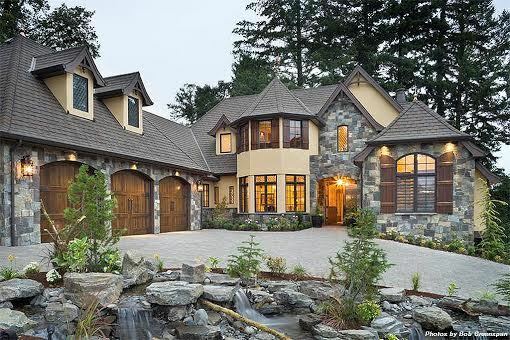 Do you go Craftsman, which, according toHouseplans.com, continue to be among the most popular style of home sold in the third quarter of 2014? Or go Traditional, which is more popular in the Northeast, Midwest and Mountain region. Meanwhile, the Southwest seems to favor Ranch-styles. Why, though, are Craftsman homes so popular? "The Craftsman is all about a boxy nature and reviving beautiful decorative art. It's well-designed, well-crafted," Marika Snider, of Snider Architecture, and a member of the American Institute of Architects' Custom Residential Architects Network, told The Huffington Post. But let's back up a second. What do all of these home style terms mean exactly? How do you tell a Modern home from a Southern home, for instance? Or a European from a Mediterranean? Luckily, Snider broke it all down for us so you'll never have to wonder again. 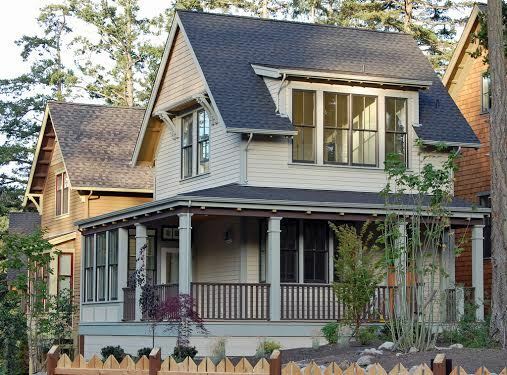 According to Snider, Craftsman style homes are reminiscent of the early 20th century arts and crafts movement. The arts and crafts movement began as a reaction to the Industrial Revolution; artists and designers sought a return to uniquely-crafted decorative arts in a time when most things were becoming heavily mass-produced. 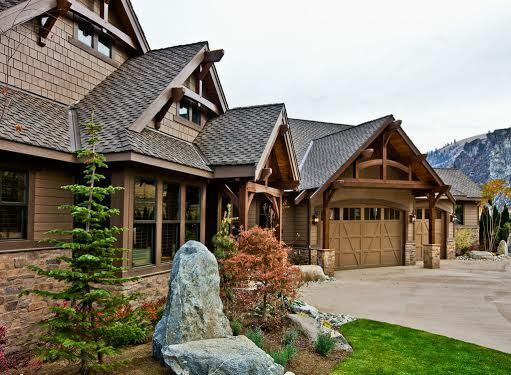 Craftsman homes feature exteriors that are usually a combination of stone and wood. The houses are often bungalows but may be of any shape so long as they emphasize a relationship with nature and the craft of construction. 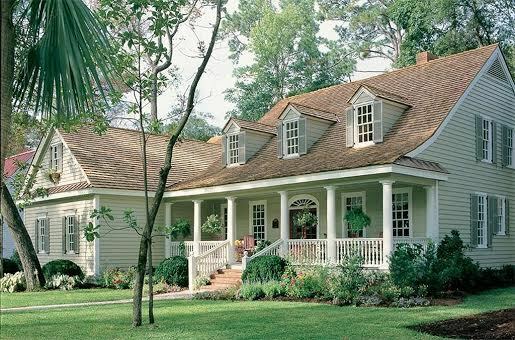 Country style homes are mostly likely an update of the popular "Colonial style." The colonial home is -- you guessed it -- influenced by 18th century colonists bringing European styles with them. They're probably most recognizable for featuring two windows on either side of the front door and five windows on top, with the middle window directly above the door. Country houses aspire to be warm and inviting. They generally have wide porches, shutters, dormers, and wood detailing, according to Snider. A Traditional style house is similar to Country style. Traditional houses differ from Country houses in that they pay more attention to historically accurate details than trying to create simple charm, says Snider. European style homes typically evoke styles from France, Italy and sometimes England. There's an emphasis on elements looking old but durable, such as plaster walls, marble or high-quality stone floors, and massive fireplaces. European exteriors may include complicated rooflines, stone, and even copper roof elements. Ranch homes are a regional style from the West and Southwest but are now found throughout the country. Originally used as housing on ranches, the term has come to mean any single story house, Snider explains. Because the entire house is on one floor, Ranch houses can be sprawling. The Ranch house became the quintessential modern house in the 1950s and '60. Farmhouses are found throughout much of the country. The foundations are rectangles usually with one or more additions; roof lines are also simple. Farmhouses follow many 19th century designs, including tall, narrow windows laid out for cross breeze, large porches, wood siding, and may even include a metal roof. Cottages are smaller houses or bungalows with details that evoke the 1920s, when a typical cottage would have a generous front porch, with a second story typically tucked into the attic. According to Snider, the interior might include built-ins like window seats, display cases or dining booths. The Cottage style is similar to the Craftsman except that the details are simpler, less expensive, and the woodwork is usually painted. 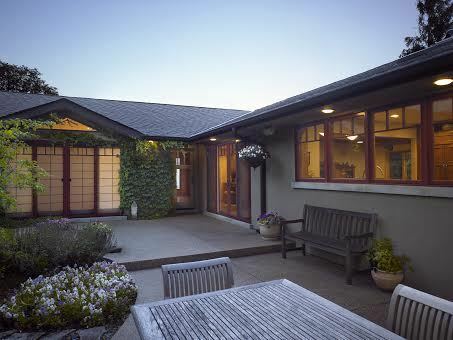 Modern homes reference a style popular in the 1950s and '60s. 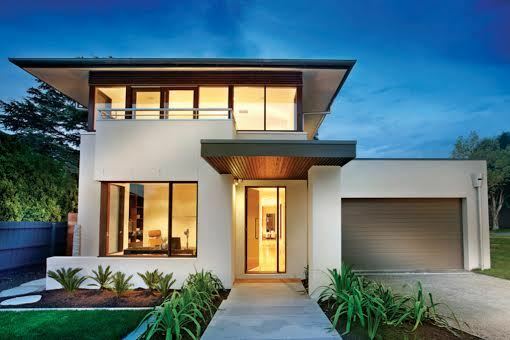 Modern houses use flat or lower slope roofs, horizontal windows and large, undecorated fireplaces. They embrace the horizontality of the landscape and automobile culture. Modern houses eschew fussy details and often employ high-quality materials such as marble, wood floors/paneling, and stone, Snider said. The overall effect creates clean lines.. 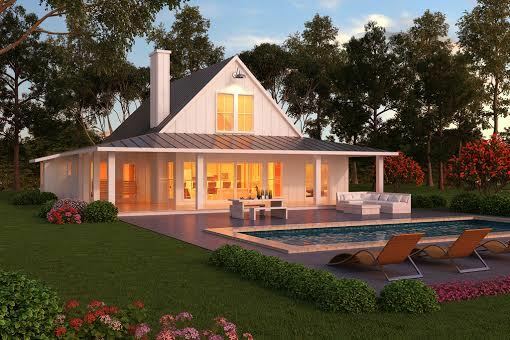 The Southern style home is a regional style developed in reaction to the hot, humid Southern climate. 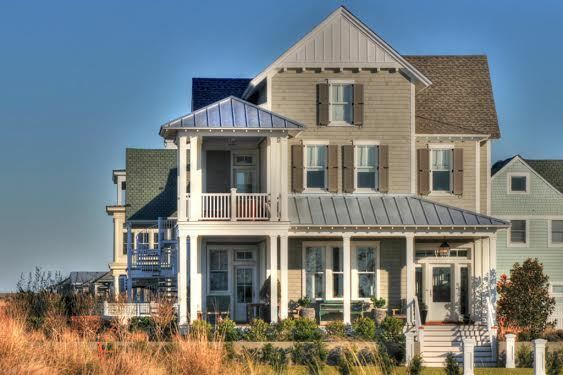 Southern houses typically include elements to take advantage of cool breezes such as elevated main living levels, wrap-around porches, large operable shutters, wide roof overhands and verandas. Southern style homes might also have 19th century details found in Plantation houses like monumental columns at the entrance, Snider adds. Mediterranean style houses evoke homes in southern Spain, France, and Italy. They typically focus on patios, courtyards and verandas as ways to extend the house outdoors. The outside of these homes usually have few details and have plaster walls. Roofs are flat or low slope and might be tiled, says Snider. The interior detailing is simple and may include decorative tile or exposed wood beams. Solar power is "the power obtained by harnessing the energy of the sun's rays." This is done through solar panels and photo voltaic cells on the panels, which convert the sunlight into usable energy. 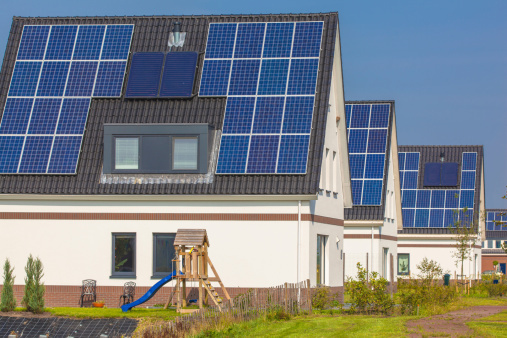 Solar power is the most common and popular option for homeowners looking to take the first step toward alternative energy. Solar uses the power of the sun, so this option is best for homes or properties located in areas where sunlight is strong year-round. There are three types of solar panel systems: On-Grid Battery Systems, which are connected to the grid but also contain batteries that can store excess energy; On-Grid Systems without batteries – these are more simple and easier to install, but if the power goes out in the area the system will shut off; and Off-Grid Systems, which are not tied to the electricity grid and generate all their power independently. At the current moment, solar power accounts for three-tenths of one percent of the total energy consumed in the U.S. (instituteforenergyresearch.org/). For those who live in year-round sunny climates – California, Arizona, Hawaii, etc. – a solar panel system can pay for itself in as little as three years (judithcurry.com). 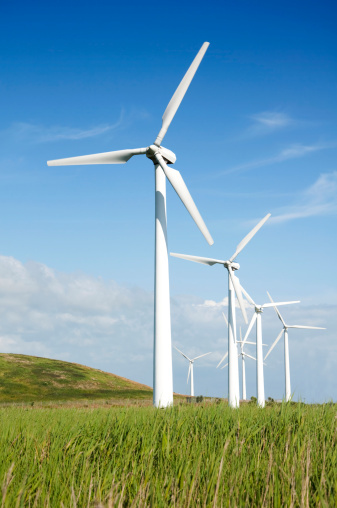 Another popular alternative energy option that has been seen throughout the U.S. is wind power. Wind power is the "power obtained by harnessing the energy of the wind." Modern wind power uses wind turbines to harness wind's kinetic energy, which is then turned into electricity. There are different types of wind power: Utility-scale, which are the large wind turbines seen on the side of hills-- these are larger than 100 kilowatts and deliver electricity directly to the power grid; Distributed, which are smaller turbines, 100 kilowatts or less, and these deliver electricity directly to a home or small business. There are also offshore wind turbines, but these are mostly found outside the U.S. At the current moment, the U.S. receives about 4.1 percent of its electricity from wind power (www.awea.org/). Wind power is an excellent option for those who live in areas where there is a good source of wind all year long. Initially, wind power systems can be expensive, and the turbine prices vary depending on the type, manufacturer and the area you live in. Many people look to the advantages of wind power over the initial investment – utility bills are cut and the homeowner has control of knowing how his/her energy is generated, and there are generally federal tax credits available to those who buy a wind power system. Geothermal systems can be expensive to set up, with estimates into the low $40,000s. 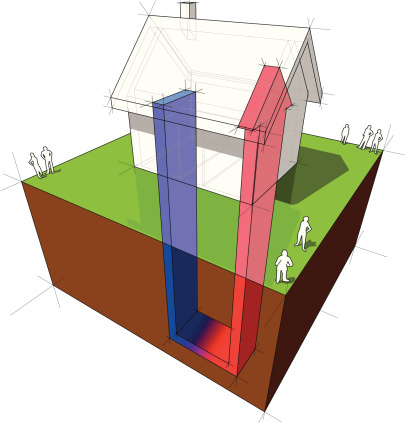 There are tax credits available, which can cover 30% of the total cost of a new geothermal system. Geothermal systems last about 20 years before needing new parts, and over the course of a 20 year lifespan, these systems can save homeowners upwards of $60,000 in electricity costs (www.esquire.com/). The U.S. relies heavily upon fossil fuels for its energy sources. Currently, 82 percent of U.S. energy demand is met by fossil fuels (coal, petroleum (oil) and natural gas) while the other 18 percent is met by renewable energy and nuclear energy (instituteforenergyresearch.org/). Electricity is a vital part of the U.S. economy, and it helps a household run every day. Homeowners have options in every facet of their lives, and energy is no different. Fossil fuels are a finite resource – exploring other options available to homeowners not only opens up access to other technologies and ideas, but it also helps the Earth. Alternative energy also presents more reliable and efficient energy sources. When a homeowner or consumer gets more reliance and efficient energy, more money is saved in the long run, making for a happy, safe and sustainable home. Interest Rates Drop Back Down to Recent Low Point: Interest rate moved back down toward the low point of a range they have moved between since the beginning of the year. Interest rates are like any other security in that mortgage bonds are traded in the open market and movements are often governed by metrics that traders use to determine the risks and rewards of trades. Economic information that changes the macro picture can often change those metrics. Currently the metrics are favoring mortgage bonds at the expense of stock assets which is moving rates lower. We are currently close to mortgage bond pricing that gave us the best rates in 50 years before rates increased in May of 2013. On Friday rate pricing actually broke below a limit we have hit multiple times recently, only to see them move back to the higher end of the range. This can be an indicator of further rate improvements. Continued data for world economic activity is supporting the move lower for interest rates. "Keep lifting me higher." Jackie Wilson may have been singing about love, but it's weak economic data and mixed corporate earnings that have been pushing Mortgage Bonds higher, helping home loan rates remain near historic lows. The first reading of Gross Domestic Product (GDP) for the fourth quarter of 2014 fell to 2.6 percent from the 5 percent recorded in the third quarter. For all of 2014, GDP grew by 2.4 percent, just slightly above the 2.2 percent in 2013. GDP is considered the broadest measure of U.S. economic activity, and strong GDP is an essential sign of our economic recovery. Also of note, Durable Goods Orders (i.e., orders for items that last for an extended period of time) fell by 3.4 percent in December, while November's numbers were revised lower. These reports show that the U.S. economy continues to muddle along after a six year recovery. In housing news, sales of new homes in December increased 11.6 percent from November, while the S&P/Case Shiller Home Price Index showed that home prices increased 4.3 percent annually in November. Home price gains have returned to more normal levels after the double digit gains seen at the end of 2013 and the beginning of 2014. There was good news from the labor sector as Weekly Initial Jobless Claims fell to lows not seen in nearly 15 years. While a Labor Department spokesman noted that some of the decline could be attributed to the Martin Luther King Jr. holiday, the news correlated with the Fed's sentiment in its recent Monetary Policy Statement that, "Labor market conditions have improved further, with strong job gains and a lower unemployment rate." And indeed, consumer confidence has been growing as January's reading surged to 102.9, the highest level in seven years. Existing December Home Sales Drop in December: The NRA released existing home sales numbers for December which showed activity slowed by 3.7% as compared with the previous month. The drop was explained by chief economist Lawrence Yun as a result of lower inventory, holiday seasonal slowdown and recent price increases. Inventory numbers fell that month for the first time in 16 months. In spite of the drop sales activity was still 6.1% above the same time last year. Yun predicts a stronger sales activity in 2015 than 2014 as rates moderate, more people become employed, new low down payment options and increasing consumer confidence. Recent consumer confidence levels rose to strength we have not seen in many years. For the same period, new home sales jumped up 11.6%. This suggests that home builders increased activity over the last two years is now being seen in the sales numbers. Case Schiller Index Shows Slowing Price Appreciation: The 20 city index for November showed pricing increases slowed to 4.3% annually. This is inline with most predictions that price appreciation would slow after being unsustainably hot for the last 2 years. Managing Director, David Blitzer, suggests it is premature to use this data to predict 2015 activity and believes the typical spring rebound will boost numbers. Still he predicts that strong pricing gains will be limited to California, Florida, the Pacific Northwest, Denver and Dallas. 2014 Existing Home Sales End Strong: After a year of slowing activity Existing sales rebounded in December. If we annualize the December numbers it would be a pace of over 5 million sales per year. Total sales for 2014 were 3.1% below sales levels for 2013. Sales activity increased last year after inventory improved during the summer. Inventory did tighten by the end of the year after the increased pace in sales had its affect. First time home buyer activity remained low with numbers around 29% it was the lowest level in 30 years. 26% of all sales were cash which is still a major part of the market. 11% of sales were distressed in 2014 which is down from 14% in 2013. FHA Makes Positive Changes for 2015: We start the year with some good news from FHA. It has been pretty much negative changes to FHA over the last few years as HUD has had to make changes to keep the program solvent. The rash of foreclosures during the Great Recession depleted the FHA reserve fund so FHA was forced to dramatically increase their mortgage insurance premiums. This has made FHA loans much less affordable and did not compare well to comparable conventional loans. FHA has just reversed course and lowered the annual MI premium by .50%. This will lower the monthly payment for FHA borrowers. They also announced a max loan amount increase for our area up to $517,500. Good news also as prices have increased. Fannie Mae and Freddy Mac Increase Loan Limits and Relax Lending Standards: Recently Fannie and Freddy made announcements clarifying policies regarding ‘reps and warrants’ for lenders. This has reduced uncertainty for mortgage banks regarding their risk of having a loan rejected by the GSE’s. This should loosen up underwriting at many banks. Now they have added to the good news by announcing a loan limit increase to $517500.